Our April challenge is Bunnies & Babies! There's a new sketch to play along with at Viva la Verve, too! Check out this fabulous layout by Julee Tilman! It was the perfect sketch to show off the sweet bitty bear and sentiment from Verve's To the Moon stamp set. I also used Verve's Rounded Scallop Frame Die, Making A Statement stamp set and coordinating Loopy Blooms Die Set to create a cluster of sweetness. Stacey!! again you just amaze with your clever choice of patterned papers... how do you do this!!!!???? It would look like the dogs dinner if I tried... and, Oh, I've tried! Oh, so adorable! Love the pretty colors you chose too! Such a fresh and creative design! Love the way you combined all the patterns and elements! This is so playful and fun, Stacey! You are the pattern queen! What an adorable card! Love the "window" and the tag background.. The black and white pops are just fab! Sweet card! Love the soft colors you used on this sweet card. So sweet! love the colors and papers. Gorgeous card! Love the colors you chose! Awww this is sooo sweet. Thanks for sharing. Love the layering. The little bear is so cute. Fabulous baby card. I love the papers you used. Great take on the sketch, I really love that floral paper! Love this adorable baby card! I also love that flower from the Making a Statement set. It goes perfect with the little bear. So, so CUTE Stacey. I love this card. TFS! This is adorable. I like your choice of papers and the sketch. Very cute baby card. Love the baby soft colors and floral paper. How precious! That little bear is the sweetest! This is adorable! As always, your paper combos are fabulous! Just the cutest card to welcome a little one. Wonderfull use of papers. Cute card! Love the little "window" and the bear peeking through! Great colors! What a cute card....love how you mixed the black and white with the other patterns. I really like the Loopy Blooms and the colors of this card. 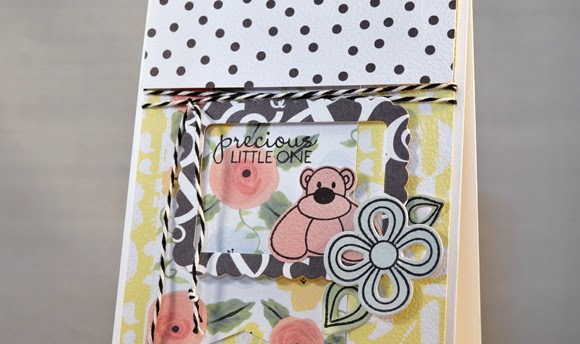 Great paper choices and I love all the layers on your card! I love your card, especially the scalloped pop up frame and the teddy bear peeking out!! He is sooo cute!! He is my favorite out of the entire zoo babies set. Also, the colors go together very well. Very cute, and I really like the papers you used. Fabulous card. I really like your combination of colours and patterns. So adorable! Great take on the sketch I love your details!